4N6XPRT Systems is the Publisher and Sole Source of a number of computer software programs designed specifically for the field of Traffic Collision Investigation and Traffic Collision Reconstruction. 4N6XPRT Systems® currently offers for sale the following programs: Expert AutoStats®, 4N6XPRT StifCalcs®, 4N6XPRT BioMeknx®, Expert VIN DeCoder®, Expert Qwic Calcs®, Expert TireStuf®, and 4N6XPRT Ped & Bike Calcs®. The two primary programs are Expert AutoStats® and 4N6XPRT StifCalcs®. Expert AutoStats® contains over 43,000 model year vehicles from 1940's-present and is the most comprehensive single source reference for vehicles sold in the U.S. & Canada currently available. The database contains vehicle dimensional data for Cars, Vans, Pickups, and SUV’s - length, width, height, wheelbase, curb weight for all vehicles in the database, and other information of particular interest to the Vehicle Accident Investigator and Vehicle Accident Reconstructionist - weight distribution, bumper height, overhang, acceleration 0-30 mph, and 0-60 mph, Moments of Inertia, etc. - is included for most vehicles 1980-present. 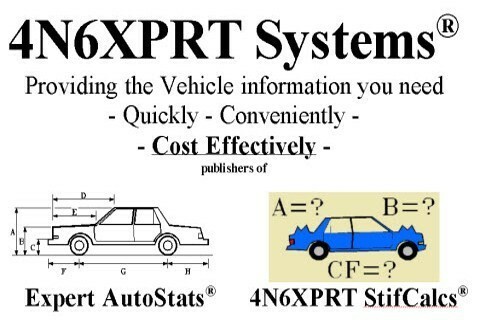 4N6XPRT StifCalcs® puts the NHTSA Crash Test database on your own computer, allowing for quick retrieval of the Crash Test data with no need to get onto the internet. The program automatically calculates Stiffness values for tests containing sufficient information to do the calculations. If there are no tests available, the program allows the user to develop Stiffness values through other means, either create CLASS vehicles based on parameters such as weight, wheelbase, body style, and impact surface (front, side, or rear), or use the FORCE-BALANCE calculation module which allows the user to calculate case specific stiffness values for a vehicle when there are insufficient tests for that vehicle in the database. 4N6XPRT Systems® is a dba of Expert Witness Services, Inc., a California corporation. Expert Witness Services, Inc. has been in business since 1974, and 4N6XPRT Systems® since 1990. Office hours are 9a-5p Pacific Time Monday-Friday.